It goes without saying that kilns are a crucial part of the ceramic process, and increasingly, potters are using electric pottery kilns. Electric kilns are far more accessible than gas kilns or wood kilns, and they are pretty straightforward, but it still can be difficult to know what you should look for when purchasing an electric pottery kiln. In this post, an excerpt from Electric Kiln Ceramics, Richard Zakin and Frederick Bartolovic explain the features that one should look for when planning to purchase an electric pottery kiln. – Jennifer Poellot Harnetty, editor. Electric pottery kilns are used by contemporary ceramists more often than ceramic kilns of any other type. They are produced in large numbers and are sold at relatively low prices. Their economy, simplicity, reliability, and relatively benign impact on the environment guarantee their great popularity. They are somewhat limited in the eyes of many ceramists because they do not lend themselves to the rich effects of reduction and flashing that characterize fuel-burning kilns. On the other hand, they have many virtues – they lend themselves to a wide color range, are simple to load and fire, and are reliable and efficient. Electric ceramic kilns are very simple structures. They are essentially closed boxes made from soft, porous, highly insulating bricks. Inside the electric kiln, running along channels grooved into its walls, are coils made from a special alloy. Heat is produced by forcing a great deal of electric current through these tightly wound coils. The result is friction and the result of the friction is heat. This heat is even, easily controlled, and quite reliable. Use your electric pottery kiln to its highest potential! This fourth edition of Electric Kiln Ceramics, has been completely rewritten, reorganized, and expanded by Frederick Bartolovic. Get it here in the Ceramic Arts Shop! Electric ceramic kilns may be fired manually or with the aid of control mechanisms. Older models are limited to terminating the firing when the kiln reaches maturity. Newer, computer-controlled designs can be used to control the firing from the beginning till its end, raising and lowering the temperature as required. Though electric kilns are useful at all parts of the firing spectrum, they are particularly suitable for low- and midfire work. They are not quite as well suited for work at the highest part of the firing spectrum: coils that are used for high firings tend to wear out more quickly than those used only for low-temperature firings. However, if careful glazing and cleaning procedures are used this need not be an insurmountable problem. The information that follows is intended to help you purchase an electric pottery kiln. There are many significant choices to make. It is a good idea to first clarify your pattern of kiln use. This will help you choose among the available kiln types and features. You must first choose the overall design of your kiln. The choice is between a front-loading and a top-loading design. The front-loading kiln has a large door supported by a substantial hinge structure placed in the front wall of the kiln. To load, you stand in front of the kiln. The top-loading kiln is designed as a chamber with a lid that is hinged and serves as the door of the kiln. To load it, you stand over the kiln opening, lean over the kiln wall, and lower the work into the firing chamber. Though loading a top-loading kiln may be less comfortable, most contemporary electric kilns are top-loading. This is because the top-loading design is simpler and therefore the kilns are much less expensive than front-loading ones. On the other hand, there are real advantages to the front-loading kiln and these may offset the price advantage. Front-loading electric pottery kilns are expensive, often costing twice as much as top-loading kilns of the same dimensions. They are easier to load and lend themselves to more efficient loading. They are generally extremely durable and will have a longer life than top-loading kilns. Therefore, they are appropriate kilns for demanding circumstances. If you are purchasing a kiln for a school or communal firing situation, you should consider a front-loading kiln. If you fire the kiln a great deal or if you fire at very high temperatures, front-loading kilns will give long and reliable service. Front-loading kilns are usually made with a heavy steel frame to support the soft brick interior. The support structure is steel bracing (usually angle iron) incorporated with flat steel sheets that are often painted. When examining front-loading kilns, look for strong bracing everywhere, especially in the door area. Door hardware should be durable and well made. Make sure the hinges are structurally sound and placed away from the heat path. Most hinge designs on front-loading kilns allow for adjustment. Kilns change over time and the fit of kiln doors may change. Adjustable door hinges can prolong the useful life of the kiln. Also make sure the front-loading electric kiln has been fitted with both floor-and door-mounted elements as well as the standard wall elements. Look for a well constructed roof. Sprung arch roof designs are especially strong and long lasting. Many kiln manufactures are now using ceramic fiber insulation in the roof, and this is a lighter alternative that doesn’t necessarily require the structural strength of a brick arch. Make sure the roof is well designed. Examine the roof structure making sure it has solid support as this can compromise longevity. If you are on a budget, you should look carefully at top-loading kilns. If you do choose a top-loading kiln, make sure it is highly insulated and its construction is of a high standard. There have long been complaints that top-loading electric pottery kilns are difficult to load. Recently a number of manufacturers have produced top-loading kilns that break with past practice in that they are wider than they are tall. A typical kiln of this design is 30 inches wide and 18 inches high. When set on its stand with the lid open, the kiln opening will be 30 inches off the floor. A kiln of this type is much less difficult to load and unload than a taller kiln. This type of kiln has been designed with ergonomics in mind. Most contemporary top-loading kilns are segmented to facilitate shipping. The first segment is the floor and resting on this is a wall segment, usually 9 inches tall. On top of this are one or two more segments the same height as the first. Joining these segments together are a series of latches and a side-mounted control box, which is not segmented. The switches and Kiln Sitter or computer controllers are mounted in the control box. This results in a kiln that is designed to be durable and trouble-free. Each segment of a top-loading kiln is bound together with a thin shell made from a sheet of stainless steel. The stacked shells hold together the soft bricks that make up the firing chamber. This shell is polished to a handsome mirror finish. Because the shell is quite thin, it is relatively inexpensive even if made from stainless steel. Top-loading kilns are designed with flat roofs, which are not as strong as an arched or fiber roof of a front loading kiln. Even a well made flat roof will fail before the rest of the kiln structure. Therefore the roof on a top-loading kiln should be carefully made and easily replaceable. Look for this when examining top-loading kilns. In top-loading kiln designs the roof must be attached to the body of the kiln with a hinge to allow you access to the firing chamber. This hinge is placed under great stress. It must support the weight of the kiln lid and must turn freely. Unfortunately, past versions of many top-loading kilns were designed with hinges that were flimsy and placed right in the path of a strong heat flow when the top was opened. Over a period of many firings this weakened the hinge and the hinges often failed. When examining top-loading kilns look for an elongated hinge structure made from heavy gauge metal that is 1 or 2 inches away from the heat path. Also look for heavy gauge metal construction around the hinges and strong welds or rivets joining the hinges to the body of the kiln and to the kiln roof. 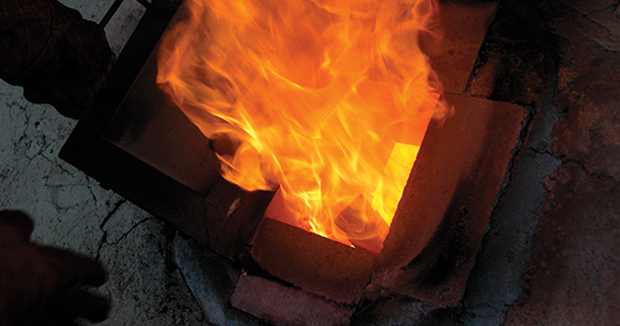 When examining top-loading kilns look for floor-mounted elements. 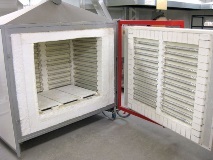 Floor-mounted elements ensure that the bottom of the firing chamber will be as hot as the middle and top of the chamber. Depending on what you are firing, floor elements may not always be necessary, but it is nice option. Electric pottery kilns are high current devices and they require special, high quality, high capacity fuses, cables, and outlets. For the installation of an electric kiln there is no substitute for the services of a qualified electrician. (Electric Kiln Ceramics includes expanded information about what you need to know about your electrical service when you purchase a kiln). access, body, bound, box, boxes, brick, ceramic, ceramic fiber, ceramic kiln, ceramic process, ceramics, chamber, cleaning, coils, color, contemporary, design, designs, electric kiln, electric kiln ceramics, electric pottery kiln, ergonomics, fiber, firing, firings, flashing, flow, front loading electric kiln, front loading kiln, glazing, heat, information, installation, iron, kiln, kiln ceramics, kiln sitter, loading, loading kiln, make, mirror, models, mounted, open, painted, pattern, potters, pottery, practice, process, produced, purchase, reduction, results, richard zakin, set, shells, shop, sprung arch, suitable, support, taller, time, top loading kiln, use, wood. Does anyone know approximately it will cost to upgrade amps or voltage to 240v. To be able to install and run a new kiln? Anyone on here ever do this electrical upgrade? Kelsey, I also bought my kiln from someone who did not have instruction manuel. Using make and model number you can go online and download a manuel. Good luck. The photo of the red hot- and open!- kiln reminds me that I have read that using an electric kiln for raku is bad for the elements. And yet I know of one production potter who rakus with electric.